This is a high series of free-falls, slides, and cascades, which spreads out across the jagged rock face at the top into multiple streams, and then passes over a smoother slab of layered rock near the bottom. There's usually very little water on this tributary to Log Hollow Falls, but it rarely dries up completely. From the intersection of NC Hwy. 280 and US Hwys. 276 and 64, follow US 276 West into the Pisgah National Forest for 10.5 miles. Turn left on FR 475B. Go just over 1 1/2 miles to a hairpin turn to the left. There is a large Forest Service interpretive sign and a gated road (FS 5043, co-designated as the Seniard Ridge trail) on the right. Park on the right without blocking the gate. 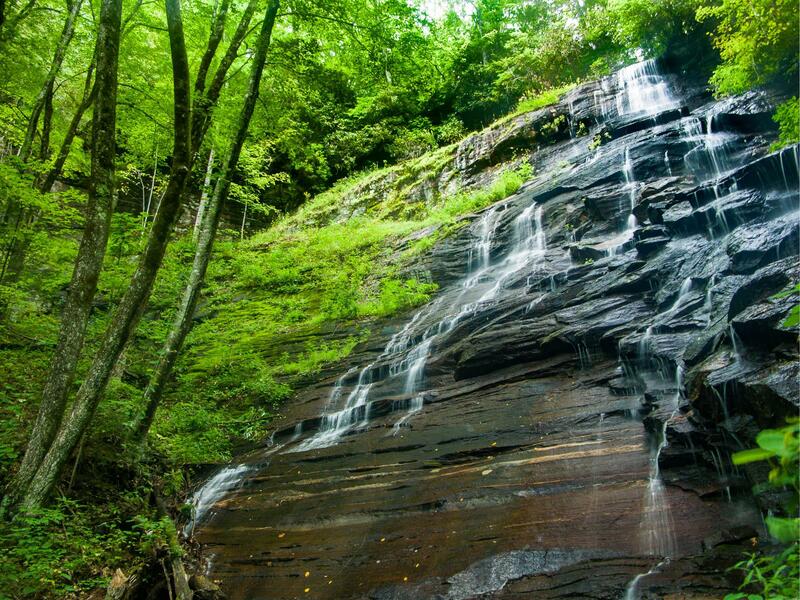 The falls is on the stream south of Case Camp Ridge which flows southeast, or one stream north of Log Hollow Branch. It's about a 5 minute, easy hike along FS 5043/Seniard Ridge Trail to the first bridge, which crosses a stream. The falls is not far upstream from the road, and although it used to be an off-trail falls, it has become popular enough in the last few years that a faint path now leads up the right side of the stream to the falls.